In accordance with the decision of the Human Rights Council, the Coordination Committee of Special Procedures transmitted the report that the Special Rapporteur shared with the Government of the Islamic Republic of Iran to the Human Rights Council. Accordingly, the Secretariat has the honour to transmit to the Council the comments by the State on the above-mentioned report. Annex to the letter dated 10 October 2017 from the Permanent Representative of the Islamic Republic of Iran to the United Nations addressed to the Secretary-General. 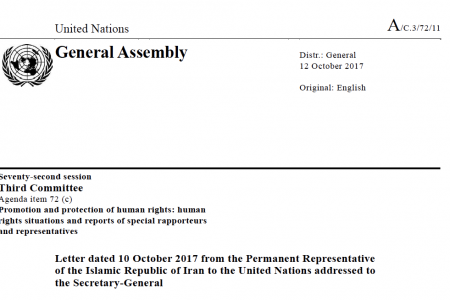 Comments and observations of the Islamic Republic of Iran on the report of the Special Rapporteur on the situation of human rights the country.